As the one-stop destination for luxury menswear, we at the Tie Bar are huge fans of the bow tie. Stylish bow ties are great not only for formal occasions and for black tie dress code, but also to show your personality. At The Tie Bar we have the biggest selection of self-tie bow ties, pre-tied bow ties, slim bow ties, diamond tip bow ties, black bow ties, white bow ties and much more. While we often opt for a self-tie bow tie if possible, knowing how to tie a bow tie is a skill to master. We know it's not easy to tie a bow tie, so we've put together a set of easy to follow bow tying steps to get you there. To tie a bow tie, the first step is to make sure that one end of the bow tie is longer than the other by a few inches. The longer end of the tie should be on your right side. Cross the longer end of the bow tie over the shorter end. 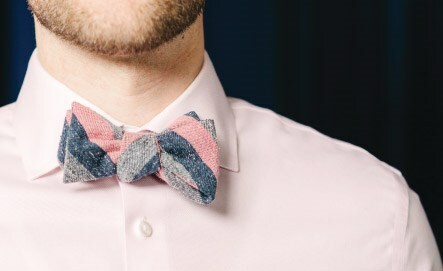 Bring the longer end of the bow tie underneath the shorter end and then bring it out from the center. Fold the shorter end of the bow tie horizontally. Place the longer end of the bow tie over the shorter end. Fold the longer end of the bow tie horizontally. Insert the longer end of the bow tie through the loop at the back of the shorter end. Pull both ends gently to tighten the knot. Adjust as needed - and don't worry, slight imperfections add character.